The Einstein-Podolsky-Rosen (EPR) Gedankenexperiment sought to demonstrate that quantum mechanics, although invariably predicting results in agreement with experiment, was an incomplete theory. In particular, the desirable philosophical feature of objective reality was lacking. According to the widely accepted Copenhagen interpretation, certain variables in a quantum system do not acquire definite values until they are measured. Thus they have no physical meaning in the absence of observation. Einstein disagreed vehemently. As he put it so succinctly, "Is the Moon still there when nobody looks?" Bohm reformulated the EPR experiment in terms of a pair of entangled spin- particles (also applicable to polarized photons) emitted from a compact source. It is a known fact that measurement of the polarization of one particle unambiguously determines the polarization of the other. From the viewpoint of objective realism, the states of both particles is assumed to exist independent of observation, perhaps as hidden variables not yet incorporated into the formalism of quantum mechanics. John Stuart Bell in 1964 devised a statistical test that could distinguish between the world views of quantum mechanics and objective realism. 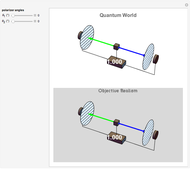 Subsequent experiments using correlated photons, notably those of Clauser, Horne, Shimony, and Holt and, most definitively, by Alain Aspect and coworkers, demonstrate convincingly that quantum mechanics is correct. This result can be summarized as Bell's theorem: No physical theory of local hidden variables can ever reproduce all the predictions of quantum mechanics. Henry Stapp regards Bell's theorem as the most significant development in science (not just physics) of the twentieth century. This Demonstration describes a simplified version of Aspect's experiment. The little cube in the center emits pairs of correlated photons in opposite directions toward two polarizers, oriented at angles and . A coincidence counter at the bottom monitors the number of photon pairs that get through both polarizers and are detected. The counter tabulates the coincidence fraction for several hundred or several thousand emitted photon pairs for a given setting of the polarizers and displays this result. 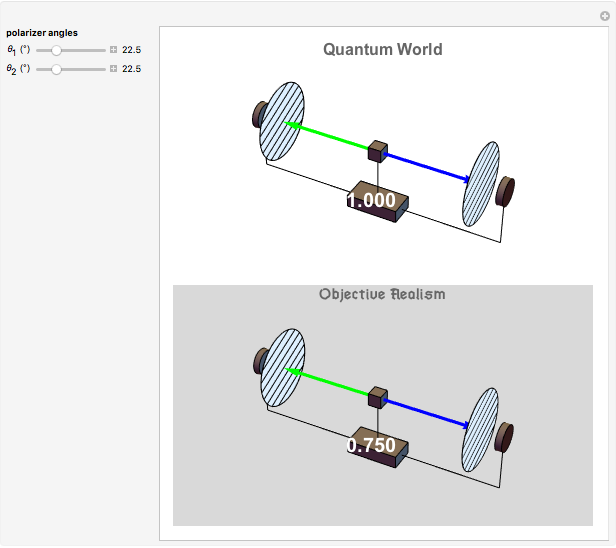 The upper part of the diagram shows the actual experimental results while the lower part, enclosed in a gray philosophical haze, shows the expectations of objective reality. Except for a few special orientations, these results differ. Correlated photons of wavelengths 551.3 nm (green) and 422.7 nm (blue) are produced by spontaneous emission from an excited state of atomic calcium produced by two-photon absorption. According to classical electromagnetic theory, linearly-polarized light will be transmitted by the fraction through a polarizer oriented at the angle θ to the polarization plane. Objective reality assumes that both emitted photons carry this information. It can accordingly be surmised that the fraction will give a coincidence count. According to quantum mechanics, however, the coincidence fraction equals - ). Since , except when one or both of and equals 0 or , the predictions of QM and OR disagree. References: J. S. Bell, "On the Einstein Podolsky Rosen paradox," Physics, 1(3) 1964 pp. 195-200. Reprinted in J. S. Bell, Speakable and Unspeakable in Quantum Mechanics, 2nd ed., Cambridge: Cambridge University Press, 2004; S. M. Blinder, Introduction to Quantum Mechanics, Amsterdam: Elsevier, 2004 pp. 272-277. S. M. Blinder "Bell's Theorem"